This unique colonial home is located in the heart of Tannersville, just minutes from Camelback Mountain Resort & Camelbeach Waterpark, The Crossings Factory Outlets, Big Pocono State Park, and numerous other attractions. The home is fully furnished with all the amenities and comforts of home. The house is three floors; the main floor consists of a fully equipped kitchen, dining room with seating for 10, full bathroom, 2 bedrooms, 1 office/study and main living room with a gorgeous stone fireplace and bar area. The upstairs has 3 spacious bedrooms, living room with television/DVD, full bathroom and sauna. The basement consists of living room with TV/DVD and bedroom with four double beds. 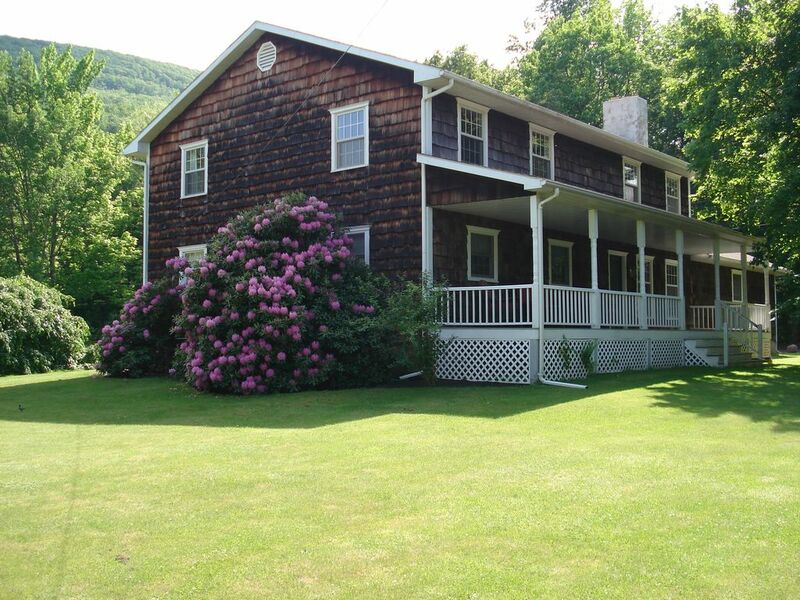 This house is perfect for multiple families, reunions and ski weekends. This is a family house rental, we do not rent to vacationing students or singles under the age of 30. SPECIALS included in rental! :$5.00 off any package from The Paintball Asylum! FREE admission to Angler's Cove Fish & Pay Ponds. We do not rent to vacationing students or singles under the age of 30 years of age unless accompanied by an adult guardian or parent. I was born and raised in the Pocono Mountains, my family has been in the ski business for over forty years and within the past few we have expanded into paintball and fishing. I enjoy traveling and spending as much time outdoors as possible. This was my family home! The house was too large for me or any of my siblings to live in so I decided to rent it as a vacation rental and now have many repeat renters that I consider family! Bath towels, hand towels and washclothes are included. My family had an awesome time! My family and I stayed here for a weekend of snow tubing. There was 15 of us total. The house was so close to everything and there was enough room for all of us to sleep! We didn't feel overcrowded! House/linens were clean. There were some ladybugs but they are lucky and it was St.Patrick's Day weekend so maybe we will have extra luck! Very spacious home. Surrounding property so picturesque. This is our second family ski trip to this property and we had a wonderful time.. Plenty of sleepin and living space for a large crowd and so close to camelback ski resort. we will be back for sure! This is quite the spacious place, and still feels cozy and welcoming. Great location, perfect for large groups and families!! We had a group of 19 people that came to stay here for a rewards trip. The house offered so much room, plenty of fun activities to do and was just absolutely gorgeous. The fireplace is the perfect place to sit around and play games. There is nearby hiking which is what we went for. The kitchen had adequate supplies to meal prep. The owner was super responsive via text. I would definitely stay here again. There were a few small cosmetic issues that if you're super picky might bother you regarding light fixtures. For us, it wasn't an issue whatsoever. The house is situated on a main road but we didn't notice noise traffic at all. EVERYONE loved this house!!!! We used this space for a family reunion and the house definitely did not disappoint! Everyone loved it. There was tons of space for the kids to run around inside. Awesome pool and ping pong in the basement for adults. And the outdoor space was divine. There are tables with ample umbrella shade and a pond right there. We even roasted marshmallows and made s'mores which my family had never done before. Then in the morning just before we left we had an awesome treasure hunt using all the trees and bushes outside to hide little toys. All in all, great stay. The only minor thing, a third bathroom would have made it an excellent stay. House is better in person! This house is a family's dream and the photos do not do it justice! We had a long family weekend consisting of 11 adults, 4 babies and 2 dogs and the house had more than ample room. The property is also close to everything- brewery, outlets, golf, etc. Our only complaint was that sharing 2 bathrooms was tough but we all made it work. Also, there is no fence so we were scared to let our dogs off the leash too long as the property is on the main road. Overall, everything was perfect and the owner provides everything you need- even a child gate! We plan on renting again! Golf: The Poconos has numerous golf courses all within a 15-20 minute drive. Ski: Camelback Mountain Resort is the biggest & best in the Pocono Mtns. The house is under a five minute drive to the ski area. Cleaning fee is included in price. Note: All rates are subject to change until booking is confirmed. $750.00 refundable security deposit required.